If there is one thing I regret about Simon Dodd’s Plaything, it is that it was only on for two nights at the Sydney Comedy Festival. So by the time of this review, all opportunities to see it will have been exhausted… that is, of course, until the next time it will be performed, because this is a truly marvelous piece of comic theatre, both perfectly at home in a comedy festival and way too clever to not be performed somewhere else soon. Simon Dodd is a significant part of the writing wit behind successful Australian comic programs such as Good New Week and The Glass House. 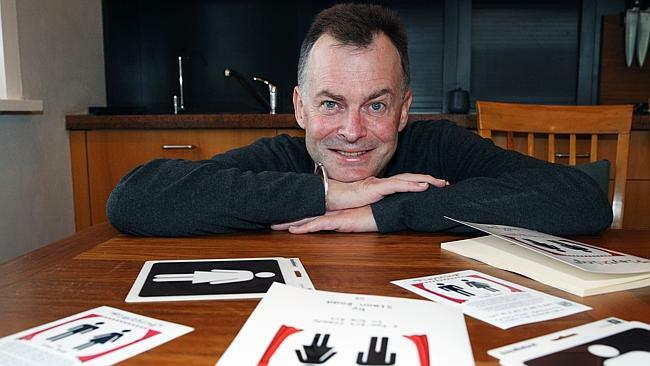 He’s won ten AWGIE’s for his efforts and has made legends of names such as Andrew Denton, Doug Mulray, Paul McDermott, Will Anderson and Amanda Keller. In Plaything he turns his hand to theatre of the absurd in an ironic mocking/tribute to a style of theatre that he clearly loves. Dodd knows what he is doing far too well for a man genuinely irritated by the ramblings of Vladimir and Estragon, so we are left with the true beauty of Plaything being a rotational hand hold with an audience he shares an affinity with, even as he locks them in a room only to find they are held in place by nothing more than their ego. 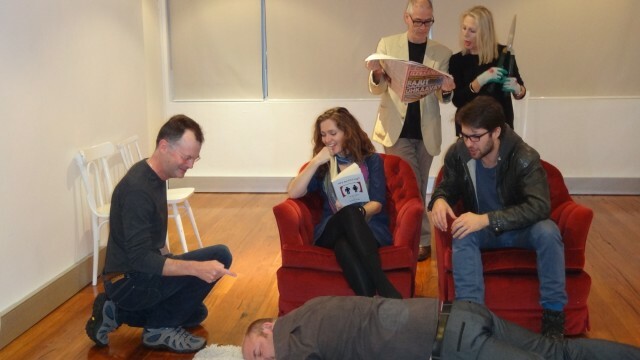 Who is the player and who the plaything, this wonderfully witty play asks. Can a play about nothing really be something? The audience faces a stage with three doors, a couch, A tray filled with alcohol, a bookcase and a TV set up. The lights go down and a young couple, him (Heath Ivey-Law) and her (Jodine Muir) race out of the audience. Seconds later he appears on stage through one of the doors that has a “Male” symbol signifying a toilet. He notices the audience, then notices that he can’t get out through the door that let him in, nor any other doors. He moves toward the front of the stage and immediately crashes into the fourth wall. He is trapped on stage. As he tries to think of ways to escape, she comes in through a door that has a “Woman” symbol signifying a toilet. She too is now trapped, she discovers as she goes through the motions of trying to escape just as he did. Because they can see an audience through fourth wall, they come to understand they are in a play. But whose play? And how long are they there for? And how do they know what to say? And how will they ever get to the toilet? It is at this point that the play starts to move through the various theatrical motifs and styles of theatre of the absurd, as the two protagonists try to understand who the writer is, who the audience is and who they are supposed to be as the two lead performers. “Who goes to theatre?” is something they ask repeatedly, as they try to work out who would be sitting in front of them, subjecting themselves to this sort of evening. The question is asked of the audience without an expected answer, but the question is posed to the broader theatre going community – what is it we expect to see when we attend theatre? The references are everywhere for the theatre lover to see – the couple are trapped in a Pinter-esque “Room” this time including a visit from an older couple (the always fabulous Tricia Youlden and Richard Cotter), Like Albees “The Zoo Story” it contains real-time conversation that may or may not have been planned – as well as a corpse – like “Whose Afraid of Virginia Wolf,” the visiting older couple have a magnificent son that may or may not be real, the young couple find out the play seems to be repeating itself as in Ionesco’s “The Bald Soprano” and so on. All of this is couched in the realisation they can’t escape, both a surrealist reference to Bunuel’s “Exterminating Angel” and the existentialist play by John Paul Sartre, “No Exit,” which gives Simon Dodd a bit of a bet both ways (and a very nice little joke) on who gets to claim to be the greater influence for Theatre of the Absurd. Through all this absurdist meandering and philosophical angst is, of course, the reliably brilliant Simon Dodd humour. As I alluded to earlier, Plaything is part piss-take, part reverential in its fast paced, circular dialogue, and the overall joke of “could absurdest theatre simply be two people who couldn’t find the bathroom,” sits all too uncomfortably close for those of us who get a little precious about this style of play. Add to this the delightfully absurd story itself of how Plaything came to be, with Simon Dodd’s play getting approved for the comedy festival, only for Dodd to discover he had to do put it all together himself. Suddenly he’s a first time director, a first time producer and – miraculously – came up with an absolutely stellar cast. I accidentally sat next to Heath Ivey-Law when I walked in, not realising he then had to squeeze past me to get to the stage, but this sort of mishap is consistent with the road blocks Dodd encountered and overcome with this great production. Everyone on the stage is at the top of their game, even poor old Peter Adams who has to spend the bulk of the show as a corpse. A special shout out has to go to the always amazing Tricia Youlden who I have a girl-crush on; she electrifies every stage she walks. Tricia and Richard Cotter were particularly funny as the most peculiar couple from “the play next door” and the vision of them waving through the doors was truly hilarious. Plaything is held together by Heath Ivey-Law and Jodine Muir, as they keep the audience wired and attentive through what ostensibly is an hour long conversation asking, “What is going on?” Simon Dodd has done extremely well with his cast, particularly for a play that had such a short prep time. Plaything will be performed elsewhere, I have no doubt. Don’t miss it if you get the chance to go along.